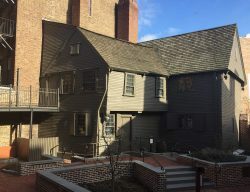 You’ve seen the lantern at the Concord Museum that helped signal “two, if by sea.” Now join other Concord Museum Members for a tour of The Paul Revere House in Boston’s North End to learn more about the man behind the midnight ride in 1775. Restored in the early 20th century, The Revere House was one of the first historic house museums in the United States. This is a members-only program. If you are not yet a member, please click here to join today before registering. A discounted admission rate of $4.50 per person will be charged to our group when we arrive at The Paul Revere House for our tour. Please register below.